Plot synopsis: A dramatized account of the Battle of Gettysburg, featuring first-hand testimony from the time. Based on a book of the same name by Earl Schenck Miers and Richard A. Brown, first published in 1948.
Review: Anyone with an interest in US history, especially Civil War history, will find something of value in this episode - though if you know little about the conflict beforehand, you won't be greatly enlightened by the end, as it focuses very narrowly on a single battle, the Battle of Gettysburg in 1863. What is perhaps most fascinating about the episode is the fact that it was broadcast 'only' ninety-four years after the battle was fought - sure, the Civil War was no longer in living memory, but the 1950s was still a time when the conflict was an important part of many Americans' mental landscapes. The most striking scenes in the episode are the personal accounts, performed by a variety of actors, of their experiences of the battle, of not only soldiers but also civilians (including one female Gettysburgian). It also strives to be even-handed, by including both Union and Confederate voices. Only a brief extract from Abraham Lincoln's famous Address is included, at the very start, and there isn't much in the way of broader context, or about the wider significance of the battle. Nonetheless, a solid episode. Plot synopsis: The story upon which this episode was based was also adapted by X Minus One (as well as by Dimension X) and my main review is of this version here. 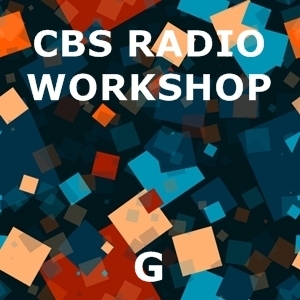 The CBS Radio Workshop adaptation differs in a number of ways - the acting is, perhaps, superior, though the singing may be worse - but the basic story is the same. In any case, I found the plot equally unappealing in both versions, so I would not strongly recommend one over the other. Plot synopsis: A quarreling married couple runs something over while driving, but the husband refuses to stop to discover what it is. Review: This episode works best during the scenes in which it presents a study of a marriage in the process of breaking down. An example of the sort of 'realistic' social drama that was prevalent in the 1950s, the story's depiction of a warring couple whose relationship has descended into bitterness and acrimony has real power. Moreover, the section at the end - SPOILER ALERT! - in which the husband reads out the letter by the man whose dog he ran over (based on a real letter, 'A letter to the man who killed my dog', by Richard Joseph, which was later expanded into a book) is quite affecting. There are some problems, though - for example, the ticking clock in the background during the scenes in the police station becomes quite irritating after a while. There is, too, an overly earnest message by New York Governor William Averell Harriman after the story has concluded promoting safer driving - today, at least, I can't imagine many people listening very seriously to a politician delivering such a worthy message. Yet overall, this is a strong, even moving, episode.